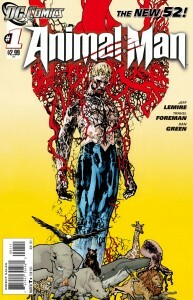 Similar to my avoidance to yesterday’s Justice League International #1, I was really putting off my read of Animal Man. Past authors (including Action Comics’ Grant Morrison) have done great things with this bizarre mid-60s hero, who harnesses the powers of the animal kingdom, but that simply didn’t sound like a feat that would be repeated by Jeff Lemire in his relaunch about Animal Man as a family guy with a daughter who is developing powers. Add to that a somewhat hideous front cover, and this book lingered at the bottom of the pile. Was I right to judge a book by its cover and its solicitation copy written by some intern in Marketing? Written by Jeff Lemire with art by Travel Foreman & Dan Green. Lemire knocks this debut plot out of the park with a nuanced first issue that’s absent a major villain but crammed with memorable character beats. He renders Animal Man Buddy Guy as a tangible, relatable family man who occasionally nips out to tackle a problem on the police scanner … but only if he has a freshly laundered costume. 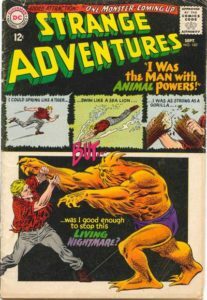 Animal Man’s complex powers are explained with ease during a brief battle as Buddy Baker quickly cycles through sets of animalistic powers (effectively, he can take on the physical ability of any animal he can connect to, scaled to the size of his body). His special confrontational “cocktail” of abilities is not only funny, but a nuanced glimpse at how power sets could really work – not exactly Green Lantern creating a massive emerald fire truck, if you catch my drift. An extended dream sequence is heavy with portents for future stories and leads to a chilling final panel. Here the affable everyman vibe melts away, and we’re into a fantasy/horror comic. I wasn’t as fond of this, but I took it for what it was – foreshadowing. I wouldn’t expect entire issues to have this tone. An intro interview with Buddy in the half-hipster half-stodgy style of actual magazine Believer is a treat. Foreman draws Buddy Baker’s domestic world in plaintive, clean-lined panels that would look at home in a b&w indie title. Faces are hyper-real and beautifully clean. It’s in Buddy’s connection to animals and in his dreams that the cover style emerges, and there it is in context. Faces are cluttered with sketch-marks, with ink crackling across them like razor-fine gashes. The latter half of Foreman and Green’s artwork may be an acquired taste, but it fits the tone perfectly and sets a beautiful contrast to the cleaner half of the book – especially as it bleeds into Buddy’s waking life. Foreman communicates so much with faces. Animal Man’s wide, hazy smile during his first outing in costume perfectly captures the conflict between his home life and his heroic adventures. Credit where due to the colors from Lovern Kindzierski. When Foreman left faces and bodies unlined and open, Kindzierski indicates contrast with varying screens of the same color. Though comics tend to sketch all shadows as black, that’s not how we really see a face – this is! Animal Man’s new costume is a little awkward – the blue and white colors are great, but the wide stands of the “A” emblem across his hips can give the illusion of his body being oddly proportioned. Animal Man completely toppled my pre-opinion of it from its solicitation. I was sure that I was squarely uninterested in the domestic life of a C-list superhero, or the trite passing on of his powers to a young daughter. In a single issue I’m more sold on the split between superhero and family man than I’ve been in anywhere else, aside from perhaps Pixar’s The Incredibles. That Lemire establishes such a compelling “everyman” hero in just a single issue with Buddy Baker is a delight. Whether the book sticks with the divide between domesticity and heroism or veers to the horror vibe of its cover and creepy final panel remains to be seen, but you should absolutely pick up the next issue to find out.